Ready to remodel and upgrade your home? If you’ve looked through design magazines, you’ve noticed a wide array of trends. While Radiant Orchid was 2014’s color of the year, by 2015 the color changed to Marsala, a terracotta red shade rich and grounded in earthtone shades. Head back in time and you’ll discover the color choices bounce from one shade to the next. What works one year changes the next. And while some bring out the beauty by keeping a home light and airy, the next year may find the trends moving to dark and majestic. 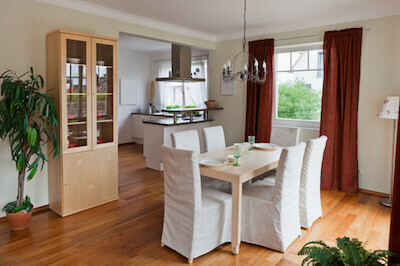 What’s a person to do when they’re ready to make final selections in the remodeling process? A good designer will tell you to ignore the trends and go with what pleases you the most. Because your home floors will be put to good use for years, it’s important to choose flooring that works for you. Flooring that makes you happy, enhances your desires and décor, and provides an easy platform to care for and maintain throughout your busy days. If all of that appeals to you, you may like the current design trends that show light colored flooring lead the way. Light colored flooring is attractive, it opens and lightens a space by reflecting more light into it. It also takes advantage of some of the most popular wood shades on earth – think light oak and birch. Light colored floors have one major advantage over dark floors – maintenance. If you’ve ever had a dark floor, you understand how difficult it is to keep dust bunnies from materializing in the corners and around your furniture. There’s also the issue of scratches – they are much easier to see on a dark floor than on one that is light. If you have a family that walks on, plays on, and in some cases abuses your floors, a light floor is the only way to go. While some people feel that elegance comes from rich, dark flooring choices, nothing can be further from the truth. Yes, light floors can take on a casual, airy appearance. But they can also make a person feel instantly welcoming and comfortable. Because they are neutral in tones, you can dress up the rest of a room’s décor to make a room pop. Light colored flooring is the perfect addition to any room in your home. From kitchens, to hallways, to bedrooms, you’ll love the light and airy feeling of having light colored hardwoods throughout your home.